Total housing starts were up in 2015, weighing in at 1.11 million—that’s 10.8 percent higher than 2014. This information is based on the Census Bureau’s recent December 2015 data release, which allows us to look at 2015’s starts as a whole. Despite December being slightly down—2.5 percent to 1.15 million—the yearly status overall was positive. What’s In Store For Housing in 2016? for what is the most affordable tier. 0.2 percent QoQ by the end of the year. highlights the diversity in performance that remains in today’s real estate market. in new and existing home sales. economic conditions as headwinds that will likely hold back a stronger pace of sales. “I feel the sky tumbling down.” Carole King. Global stocks fell, and the Dow lost more than 1,000 points from December 29 to January 7 due to struggles in China, the world’s second largest economy. Job creation surged at the end of 2015 here at home, causing additional stir in the markets. Employers added 292,000 jobs in December, the Labor Department reported Friday. This was well above the 200,000 expected and follows solid jobs creation in October and November. The end of 2015 marked the fifth straight year in which employment grew by 2 million. While month-over-month wage growth from November to December was stagnant at 0.0 percent, year-over-year wage growth was 2.5 percent. The Unemployment Rate remained at 5 percent, a seven-year low. The Jobs Report is considered a market mover each month; however, continued news of China’s economic struggles was the real game changer last week as global markets fell. When Stocks plunge, Mortgage Backed Securities and other Bonds usually improve. Because home loan rates are directly tied to Bonds, home loan rates can improve in the process. The good news for homebuyers and homeowners right now is that rates are currently hovering near all-time lows. If you or someone you know has any questions about home loan options, market conditions or current rates, please don’t hesitate to contact me. The rest of the world outside of the U.S. is struggling to grow. And the U.S. high-yield bond market is sending serious warning signs today. The most recent bout of fear in high-yield bonds (also known as “junk” bonds) was strong. Visualize it with me… A group of old-time miners carries a caged canary into a mine tunnel with them. If lethal gases are present in the mine, the canary will die… the miners will realize there’s danger they can’t see… and the miners will get the heck out! Junk bonds are just like the canary… When the junk-bond market starts to die, the Federal Reserve needs to pay attention… There’s danger ahead. The junk-bond market has been a great “canary” over the past quarter-century… forecasting trouble and Federal Reserve rate CUTS. The message from the chart is simple: Junk bonds tell the Fed what to do. 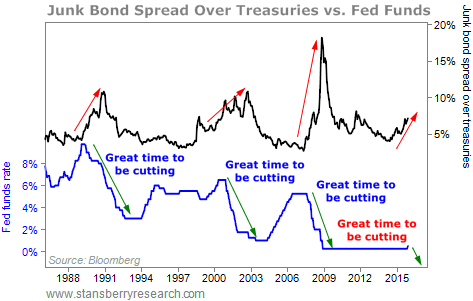 When the junk-bond-rate “spread” starts to rise quickly, the Federal Reserve starts to cut interest rates. The Fed doesn’t stop cutting interest rates until the bleeding in junk bonds has stopped. The message from junk bonds today is that times are still dangerous out there… that conditions are unsafe… and that it’s time to hustle out of the mine. In normal times, the Federal Reserve would lower interest rates to ease the stress. Instead, the Fed is RAISING interest rates. So why are the folks at the Fed raising rates? In short, because they said they would… The Fed might have lost credibility if it didn’t raise interest rates. It has been crying wolf about raising rates for years. The Fed accomplished its one goal this month – it showed us it’s not crying wolf anymore. But with all the trouble in the world and in junk bonds, the Fed really shouldn’t dramatically raise interest rates in 2016. It should use a cautious approach. I’m talking about rental real estate. my average return has been between 5% and 8%, without leverage. When I use bank financing, those numbers are in the 12%-15% range. income-producing properties… either residential or commercial. it’s money cost of borrowing, the maintenance, and the theoretical loss of income by charging a modest rent. Had I used bank financing, I would’ve made more – without any significant increase in risk. I own dozens of individual properties like this. They send me checks – usually thousands of dollars – on the first of every month. That’s a nice way to begin your month. Mark on his favorite day of the month: the first. On the credenza are 24 small red binders. Each represents a separate real estate investment I’m involved in. partnerships or corporations. Some are rental plays. Some are build-and-sells. If you decide this is the year to begin a real estate portfolio, start slowly. It took me years to dig myself out of that mistake. I emerged a smarter (but not-yet-smart-enough) real estate investor. Take your time. Be selective. Educate yourself. Some of what’s on the bookshelves is full of misguided advice. Club. That, you can trust. time (not counting your other assets). And you’ll be well on your way to retiring as a multimillionaire. your personal business – most lucrative wealth-building activity you ever got involved in.